This summer, I set a challenge for myself. I was in desperate need of a new work wardrobe, or, heck, a new wardrobe all together. But in an effort to save a ton of money and stay green, I decided I wanted to update my closet exclusively through Pittsburgh consignment shops. I thought I’d hit up a ton of them. But two things happened. Apparently everyone in my life thought, “Femme’s clothes are getting so bad; I’m going to buy her some new ones.” I swear I would have ended up on “What Not to Wear” were the show still on. 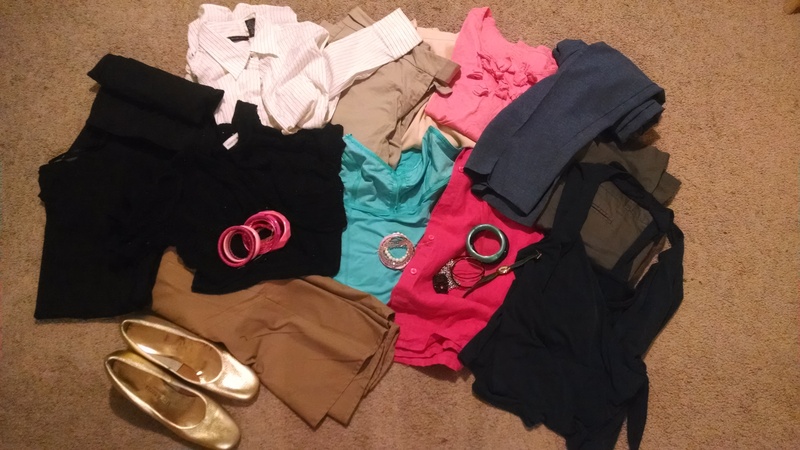 As a result, I ended up with a pair of leggings, a skirt, a dress, and a bunch of work shirts from concerned family and friends. They all bought new, but I wasn’t about to turn away gifts and go on some eco crusade. It was actually super nice of everyone. The other thing that happened was that I got a TON of stuff at one store for a crazy low price. Want to see where I shopped? City Triangles dress from Clothes Minded in Bloomfield for $10. The first place I stopped was Clothes Minded on Liberty Ave. in Bloomfield. They’re not really a consignment shop, but more of a resell store. Which worked awesome for me because I had a huge bag of clothes that no longer fit that I was looking to sell. They weren’t quite the right brands to put on consignment, and I prefer the ease of reselling, anyways. I browsed around while they were checking out all my old clothes. I was looking for a dress to wear to a friend’s wedding and some clothes for work. I didn’t really find much of the latter. Their clothes are geared towards younger people. They had a pretty wide array of stuff for both men and women, but if I had to pick a demographic it would probably be “hipster.” There were tons of casual clothes and some dressy-casual clothes. 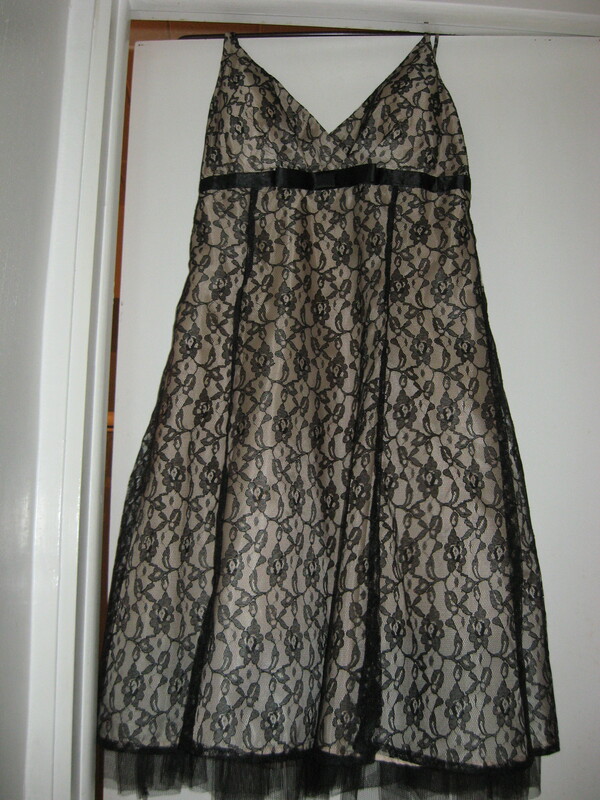 So there weren’t any evening gowns, but there was the perfect dress to wear to that wedding. It’s pictured above. It was listed for $15. But something amazing happened: they actually bought something I tried to sell! The clothes I brought in were in great condition, but I don’t normally have too much luck with this type of thing. (Check out this video for how it usually goes. The sign language isn’t at all right, but I guess that’s not the point.) They bought a pair of shorts, bringing my grand total for my wedding attire down to $10. I walked in on a BAG SALE! I guess I didn’t end up making it to any Pittsburgh consignment shops at all. Because the second place I went was Treasure House Fashions on McKnight Rd., and they’re actually a charity. An amazing one at that. They get their clothes from people who donate them, and then make money both through people donating money and people buying those donated clothes. I was one of those people buying. But what is the charity? They provide clothing for women in transition, victims of domestic abuse, and displaced homemakers re-entering the workforce. They work with a bunch of different local organizations, and their work has a huge impact on the community. When I happened to walk in, it was a couple of weeks into their bag sale. Which was such a nice surprise. Everything you could fit into a paper grocery bag cost only $20. (Normally their prices per item range from $14-$30 with a few exceptions.) The place was a little picked over as apparently everyone in the North Hills knew about this sale before I did, but I had a lot of luck finding business casual items. They also had some sleepwear, a little bit of casual wear, some maternity clothing, and evening gowns. They were getting new inventory ready for after the bag sale’s conclusion, so if you head in now there will be rooms and rooms full of options. They also had huge sections for plus and petite items, even with the bag sale in its height. Altogether I got 2 tanks, 2 short-sleeved shirts, 2 long-sleeved shirts, 1 shrug, 4 pairs of pants, 1 pair of shorts, 1 skirt, 1 pair of shoes, 1 watch, 1 necklace, and too many bracelets to count for $20. Brands included Ann Taylor, Fashion Bug, Mossimo, Monterey Bay, New York & Company, Coldwater Creek, Jones New York, Preswick & Moore, and Bridgewater Studio. It was craziness. I even had to go back three times because I wasn’t getting enough to fill my bag. I ended up with everything I could possibly buy for me, so I picked up a couple of things for a family member. The bag sale runs for the entire month of August and the entire month of February every year. So I think I did pretty well. $30 for a new work wardrobe and a dress to attend a wedding. Maybe next year I’ll actually hit up some Pittsburgh consignment shops, but this year the resell and charity thing panned out well for me. This entry was posted in Pittsburgh, Ways to Save Money on September 1, 2014 by femmefrugality. What you did was a serious score so kudos! Congrats on the low spend and getting some work clothes! Thank you, Kassandra! I just walked into the second one unknowingly, too, which was kind of amazing! Absolutely! You can get really nice brand names at a cheaper price than buying newer, lower quality clothing that way, too. Absolutely! You can get really nice brand names at a cheaper price than buying newer, lower quality clothing that way, too..
Amen! The clothing budget is pretty low right now, but the clothes were much needed. Yay for a summer win! Nice! I love the shoes. Very cute! Thanks! Me, too! Hoping they’ll spruce up otherwise drab work outfits! 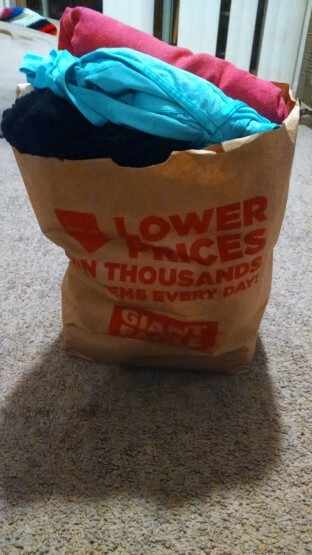 Awesome – love the 20$ for a bag of clothes. That reminds me that I need to try and consign a few things! Even if its only a few bucks – better than clogging up my closet. I don`t think people truly appreciate thrift or consignment. It is great for kids clothes. That bag sale sounds awesome. I did the exact opposite in a thrift store once where you paid $20 and got a mystery bag of clothes. Not remotely the frugal option, but definitely interesting. I wish I were better at sewing, because then I could refashion my bizarre thrift store finds. I love Clothes Minded! Their vibe is a lot less pretentious than Avalon Exchange, where I shopped for a long time but am slowly getting more and more turned off by because of the atmosphere. Also, I had heard about Treasure House, but just assumed the store was for those women in unfortunate domestic situations. I didn’t know I could shop there too! I definitely need to step up my game when it comes to consignment shopping. I’ve heard about so many different places in the city, but have only explored a handful of them. I also want to do more Goodwill hunts, and upcycle things. I just invested in a sewing machine and dress form, so maybe I can show off the fruits of my manual labor sometime soon. Lol. That’s awesome! You got some really great deals. I love shopping at those kinds of places, but they are few and far between here, so we usually try to hit some up when we go to “the city”.